Almost certainly originally completed as chassis 3080, this 300S represents the ultimate development of the type. Using insights from works driver Stirling Moss, it incorporated 450S derived brakes and a five-speed gearbox. The car also sported a long nose to cheat the wind and flared arches to accommodate the larger brakes and associated wheels. During the summer of 1958, it was raced for the factory by Stirling Moss, scoring wins in the GP Vila Real in Portugal and a race at Karlskoga in Sweden. 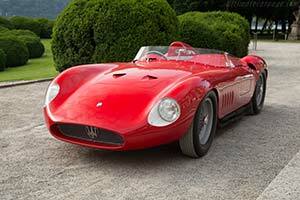 Following Maserati's retirement from sports car racing, it was rebuilt and fitted with a new engine with number 3083. The chassis was re-stamped accordingly and sold as a new car. Through Rally Motors in New York, the car was sold to American entrant Ed Fuchs. He fielded the car during 1959 for a variety of drivers including the very talented Pedro Rodriguez. Not raced again after the 1959 season, it was eventually sold on and spent the 1970s in the United Kingdom. During the early 1980s, it joined the legendary Japanese collection of Yoshijuki Hayashi. During the 1990s, it returned to the United States. It was owned for many years by Steven Read, who regularly showed and raced the car on both sids of the Atlantic. In 2014, it was acquired by the current, European collector. He entrusted the car to Austrian specialist Egon Zweimuller Jr, who set about restoring the car from the ground up. During the process, Zweimuller removed a staggering 30kg of filler from the bodywork that had been applied during previous restorations. The work was completed in time for the 2017 Concorso d'Eleganza Villa d'Este where it placed first in class.